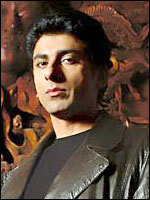 Born in 1970, Ahsen Bhatti first appeared on television in 1984, in the children's TV series Dramarama , at the age of 14. Eight years later, he appeared in Family Pride (ITV, 1991-92). During the '90s Bhatti 's television career was steady. In 1994, he was cast as a doctor in Cardiac Arrest (1994-96), then again in Grafters (ITV, 1998-99) and The Grimleys (ITV, 1999-2001). During this period he featured as a pimp in Band of Gold (ITV, 1995-96), and appeared in Holding On (BBC, 1997), The Ghostbusters of East Finchley (BBC, 1995) and NCS Manhunt (BBC, 2001-). Bhatti made his feature film debut in 1995 in Brothers in Trouble (d. Udayan Prasad), following up with Sixth Happiness (d. Waris Hussein, 1997). He also briefly appeared in Bend it Like Beckham (d. Gurinder Chadha, 2002) .